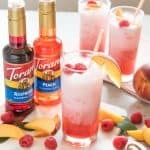 Easy, refreshing, and fun, these Raspberry Peach Italian Cream Sodas made with Torani syrups are the perfect non-alcoholic drink to serve all summer long! Fill a tall glass with ice. Pour in enough club soda to fill approximately 2/3 full. Add both syrup flavors to the club soda, followed by the half-and-half. Measurements will vary depending on the size of the glass and your taste preference for levels of sweetness or creaminess, so you may want to start with the smaller amounts and adjust up. Swirl together and garnish with fresh raspberries, peach slices, and whipped cream, if desired.